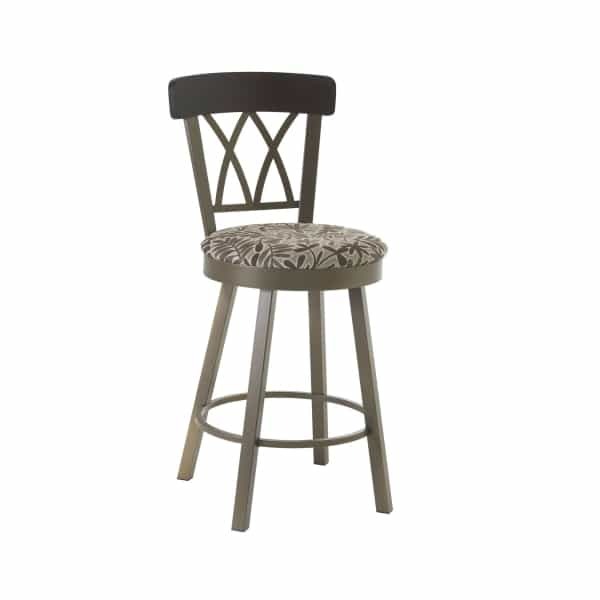 The Brittany Counter Stool is part of the countryside selection of Amisco bar stools. You can find Amisco bar stools that range form library-style to ultra modern to more grounded and down-to-earth. The Brittany Counter Stool sits in the third category, with a simple and appealing design that matches multiple finish and fabric combinations. Amisco offers a huge range of finishes and fabrics so that you can find the perfect combination to suit your space. Choose light finishes and earthy patterns, as shown here, or put a deeper spin on the Brittany Counter Stool with a darker solid color. The Brittany Counter Stool features a steel frame that is covered with a powder-baked finish to protect the stool from scratches. The seatback features a comfortable wood backrest, a plush cushion, a swivel seat and a 360-degree footrest. If the style of the Brittany stool piques your interest, delve into the finish and fabric options to find a match that delivers love at first sight.